I’m wondering how this recipe wasn’t my first on the blog! This is the first dish I cooked first on my own to my memory and the one that is most frequently made in my kitchen. Weekends during my 5 and odd years of Chennai life hardly went without this one simple meal. There are a bunch of memories tagged to this, from the family and friends and the recipe is easily one of my favorites. 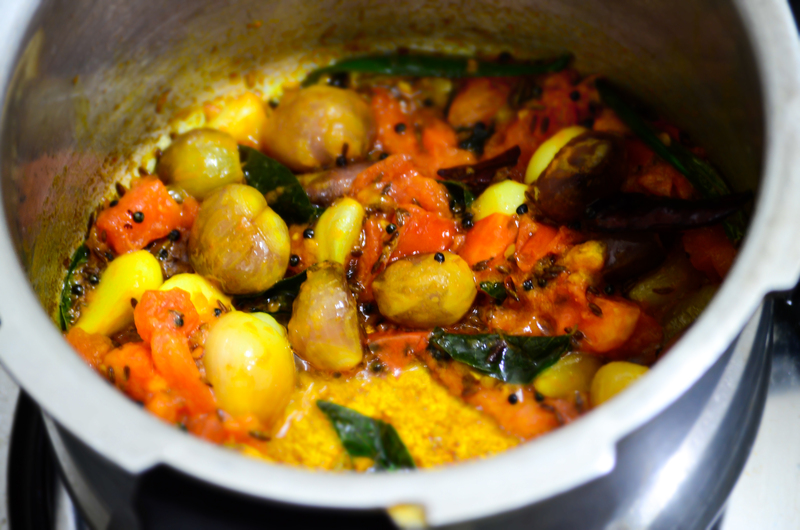 Arisiyum Parupu is a native dish of the Kongu region in Tamil Nadu. The recipe is a very common in the houses of Coimbatore/Erode. 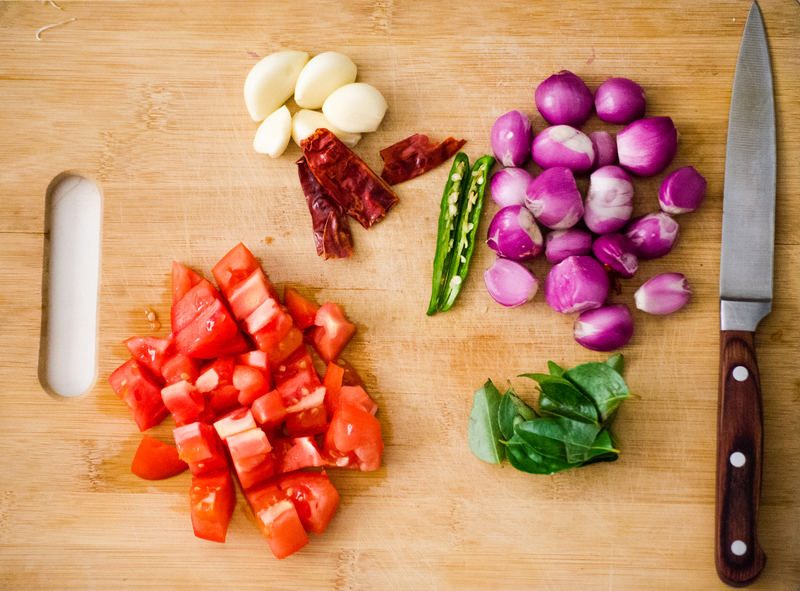 A very simple, yet healthy and tasty one pot meal that gets cooked in less time. The ingredients are minimal and makes the work easier. 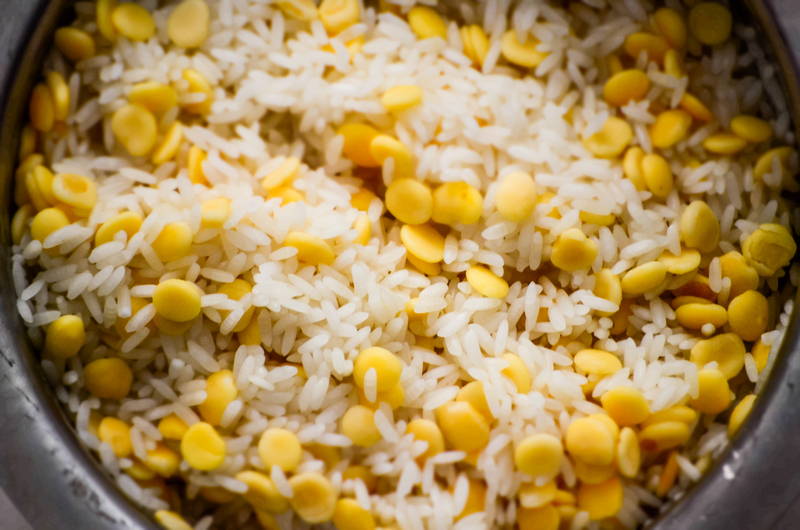 The rice is made using different lentils and the common one is the Toor Dhal recipe. 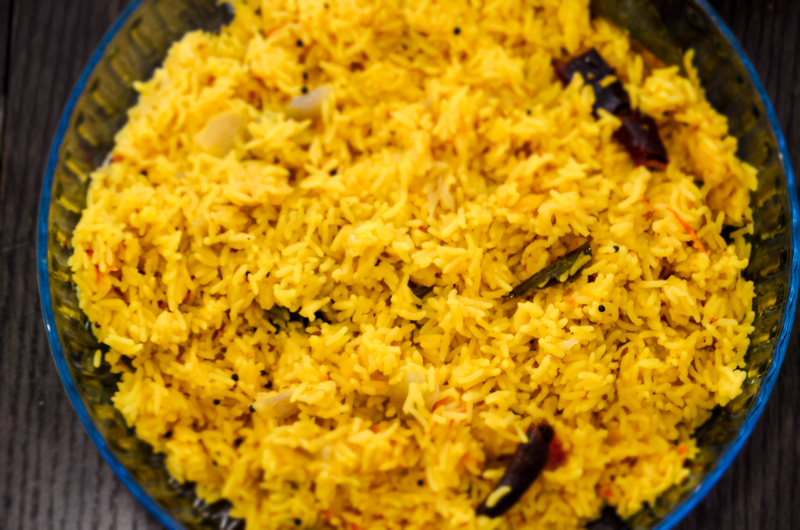 Soak one cup of rice and 1/4 cup of toor dhal together in a bowl for about 15-20 minutes. Peel the skin and use shallots and garlic cloves as such, do not chop. If you don’t have shallots, use onions cut length-wise. Chop tomatoes, slit the green chilies and break the dry chilies. When sputters, add the shallots, green chilies, dry chilies and garlic. Fry for a minute and add a spoon of cumin seeds. Add chopped tomatoes and cook for a couple of minutes till tomatoes turn mushy. Add soaked rice and dhal mixture after draining the water and mix everything together. Add 2 cups of water and required salt to taste. Bring the water to boil, check for salt and close the pressure cooker with the lid and the weight. Switch off after three whistles, two in high flame and one in simmer (this is my usual count, you may follow your own method of pressure cooking). Once the pressure settles, open the lid and fluff the rice and transfer to a wide plate or a bowl. Use a generous helping of ghee and serve hot. Curd and pickle are the easy companions but if you have time, make a simple brinjal-potato poriyal or scrambled eggs with salt and pepper as side dishes. They are the traditional companies for Arisiyum Parupu ! Tip: Do not overcook onions, garlic and the cumin seeds. Saute them only for a minute or two. Also, add cumin seeds always before tomatoes.This gives a specific taste to the rice, believe me. My all time favourite food! Awwwwww enaku ippo sapdanum pola iruke .. Tastes better when it is made with iron utensil !